Sometimes a vegan likes to eat the things they loved before becoming one who avoids animal products. Many vegans will say cheese is one of the hardest things to give up on the path to veganism. There are many cheese substitutes in the grocery store now, many more than just 5 years ago. As a vegan you have to read your labels even on these veggie-based cheeses as many contain casein. That’s something I’ve never understood. Why put milk in a cheese if your trying to make a veggie cheese? Doesn’t that defeat the purpose? I realize the casein is there to give the cheese the proper texture when melted but if you can’t obtain the proper texture without it then why bother making the veggie cheese to begin with? Many vegan cheeses have found the proper ingredient formula to get all the stretchy goodness of melted cheese without the extra animal squeezings. Galaxy Nutritional Foods is the latest to give this a try. 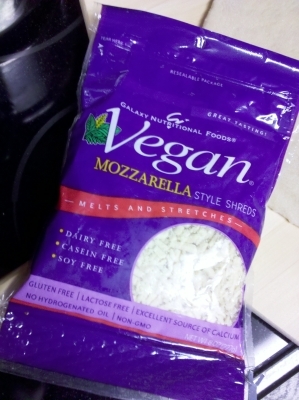 Galaxy Nutrition Foods has just come out with two varieties of vegan cheese shreds, mozzarella and a Mexican blend. I gave the mozzarella a try on the only proper way to do so: pizza. Not just any pizza but grilled pizza, my favorite way to bake a pie. The cheese has a good flavor and melts very well. As far as stringy stretch it doesn’t quite get there like another very popular vegan cheese but instead has a more “liquid” consistency when melted. As far as flavor, it is very tasty. I would prefer more of the stretch but still a very good vegan cheese. I’ve only found Galaxy Nutritional Foods Shreds at Kroger and EarthFare but I’m sure it will be making it’s way to other outlets soon. A new vegan option has cropped up in the Coolsprings area. Brixx:Wood Fired Pizza has opened on McEwen Drive next to Whole Foods and behind Bricktops. I managed to get a pre-opening invite to enjoy dinner while they practiced their daily motions thanks to Coolsprings.com. 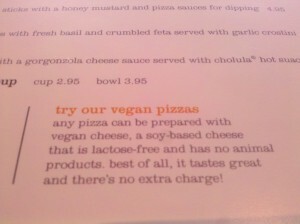 The website and menu clearly states many of their items can be made vegan and that they offer vegan cheese as a substitute for regular cheese at no extra charge which is uncommon as there is typically an extra cost for this which most restaurants adopt. Brixx uses Follow Your Heart mozzarella (UPDATE: Brixx is now using Daiya mozzarella as their vegan cheese option)so you’ll be getting a quality vegan cheese and it’s truly vegan so no worries about whether it contains casein. Our complimentary dinner included one appetizer, a salad, two pizzas, a sandwich and a pasta dish. We chose the Wood Fired Pita Chips and Three Dips as our appetizer. It was served on a large plate with three small scoops of hummus: black bean hummus, roasted red pepper hummus and traditional hummus. The hummus was served on a bed of greens and topped with roasted red peppers and cumin. Pita triangles, the equivalent of about three pitas, that had been toasted in the pizza oven were served around the perimeter of the plate. The hummus was very thick which made dipping a bit hard but flavorful and at $5.95 was a good appetizer though I would like a little more hummus. I didn’t get to eat much of this one as the kid really enjoyed it and decided to take it for her own. That’s a positive vote for the hummus. Our salad was a modified Brixx Salad. We modified this one by simply leaving off the goat cheese. 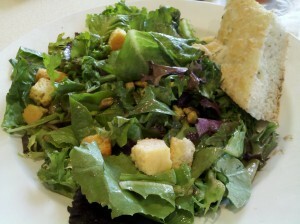 The salad is a spring mix topped with croutons and pistachios and served with a balsamic vinaigrette. It’s served with a large piece of focaccia which looked to have cheese toasted onto it so we just ignored the bread. I’ll be sure to inquire next time about it as it did look very inviting sitting on the edge of the plate. Another $5.95 selection and worth it. I would consider it a big salad. It’s enough to share if you’re having an entree as well. 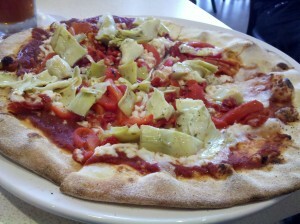 We chose two pizzas, the Artichoke which is served with a basil pesto instead of red sauce. We asked our server if the pesto contained cheese and she quickly ran back to the kitchen to ask. She returned to tell us it did and we substituted red sauce instead. Substituting seems to be welcome at Brixx and didn’t throw any confusion into the process so have at it if need be. The Artichoke pizza is topped with artichokes, roasted red peppers and sun-dried tomatoes. This pizza could be named the 80’s pizza. Anything with sun-dried tomatoes belongs in the 80’s. Not that I’m complaining about sun-dried tomatoes, I love them. Then again I love the 80’s, so there. 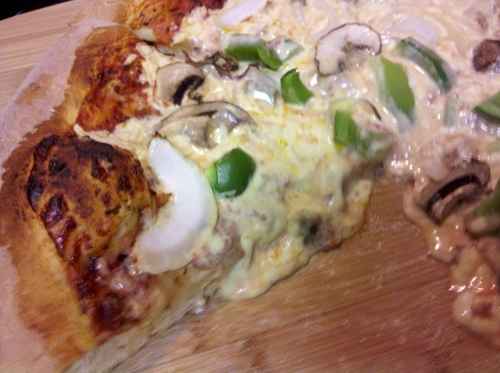 Of course, we also substituted the mozzarella for Follow Your Heart cheese. Our second pizza was the Wood-Roasted Vegetable. This was more of a typical veggie pizza with mushrooms I couldn’t tell which type exactly, broccoli, bell peppers and onion. Substituting Follow Your Heart cheese this was also a very good pizza but I think I pick the Artichoke pizza as my favorite of the two. I just really like artichokes on a pizza and then there’s that 80’s thing. The kid got her own kid-sized pizza with red sauce and vegan cheese. She devoured the entire pizza, a good mark as this kid is a very picky eater. 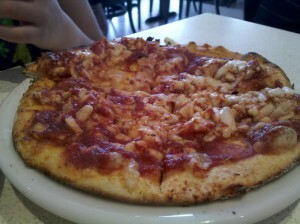 All of Brixx’s pizzas are on a thin, crisp crust and baked in a wood oven. The crust is available in original white flour or whole wheat and both contain nothing animal-derived right down to the turbinado sugar used. 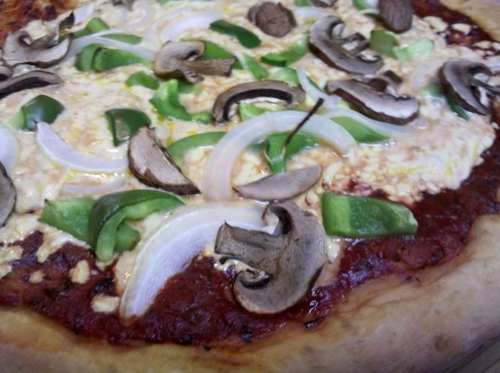 These are 100% vegan pizzas when ordered with Follow Your Heart vegan cheese. 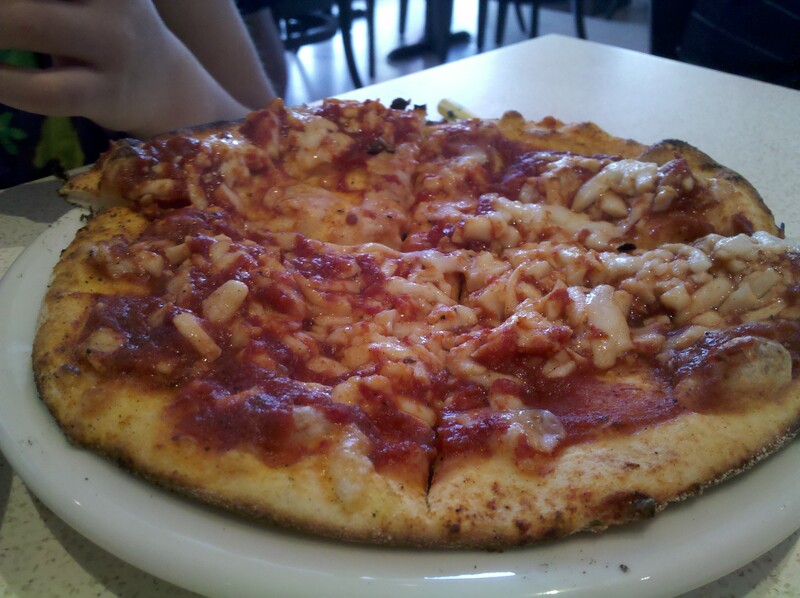 Brixx also serves pizzas with a gluten-free crust option at a $2 upcharge giving the gluten-challenged a pizza beacon that some may have missed for some time. Prices for the pizzas range from $8.95 to $11.95 though a pizza without all of the animal accoutrements will be in the $8.95-$9.95 range. These are 10-inch pizzas, six slices per pizza and with a good dose of toppings. Another note to keep in mind, after 10pm all pizzas and appetizers are 2-for-1. Get your late-night munchies on! We also ordered a Wild Mushroom Wrap. 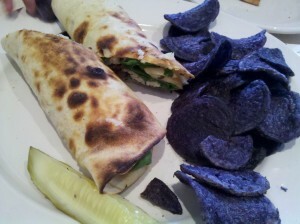 I expected the typical wrap: fillings in a run-of-the-mill tortilla. I don’t know why I expected that but that’s the typical wrap these days. That’s not what we got. We were served a mix of portobello, shitake and white mushrooms, spinach and Follow Your Heart cheese wrapped in a slightly toasted pizza crust. One of the franchisees came to our table and explained that they put the pizza crust in the oven for two minutes and then wrap the fillings in it. This is a great wrap. The pizza crust made this wrap superb not to mention the fresh, tasty fillings. If you’re ordering this as a vegan be sure to leave off the sun-dried tomato (80’s) aioli and substitute the Gorgonzola cheese. 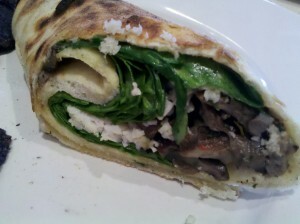 $7.95 for the Wild Mushroom Wrap. All sandwiches and wraps are served with a choice of pasta salad, bean salad, fresh fruit or chips. We didn’t get a pasta as we were already feeling like pigs. There are vegan options on the pasta menu and whole wheat pastas are available as well. Brixx also has a wide range of beers on tap including Abita Root Beer for the sugar-fiends. With the 2-for-1 pizza deal and array of brews look for Brixx to be busy late nights and with the delicious food they should keep a good crowd at all other times. I’m proud to have a new vegan option in Coolsprings. 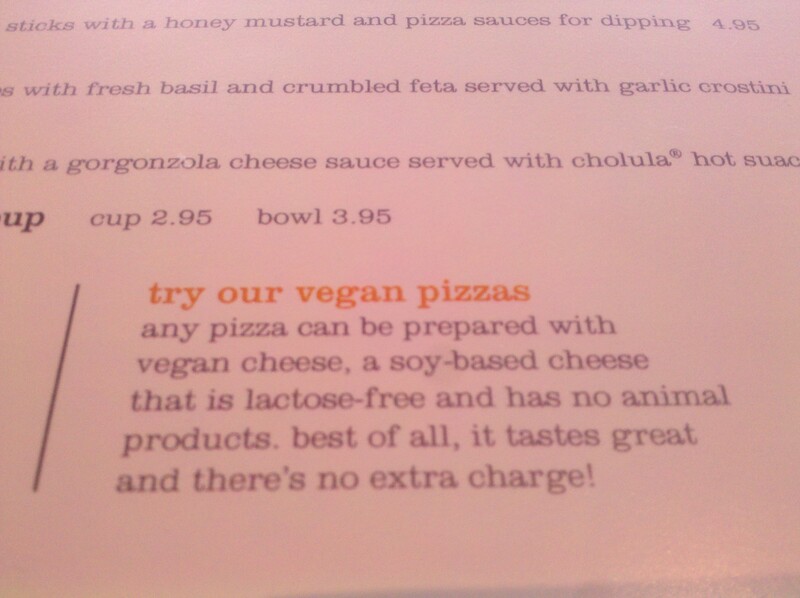 UPDATE: Brixx now uses Daiya mozzarella as their vegan cheese option. Do you drink milk? If you do you contribute to this. Do you eat cheese? If you do you contribute to this. Do you drink milk but it comes from that farm where cows are “so happy”? If you do you still contribute to this. Do you eat cheese but only from the small production farm that is organic? If you do you contribute to this. Do you just love you cheese so much you can’t give it up but still believe those cows are taken care of? Yes, you still contribute to this. Do you just not care? Then you don’t care if you contribute to this. 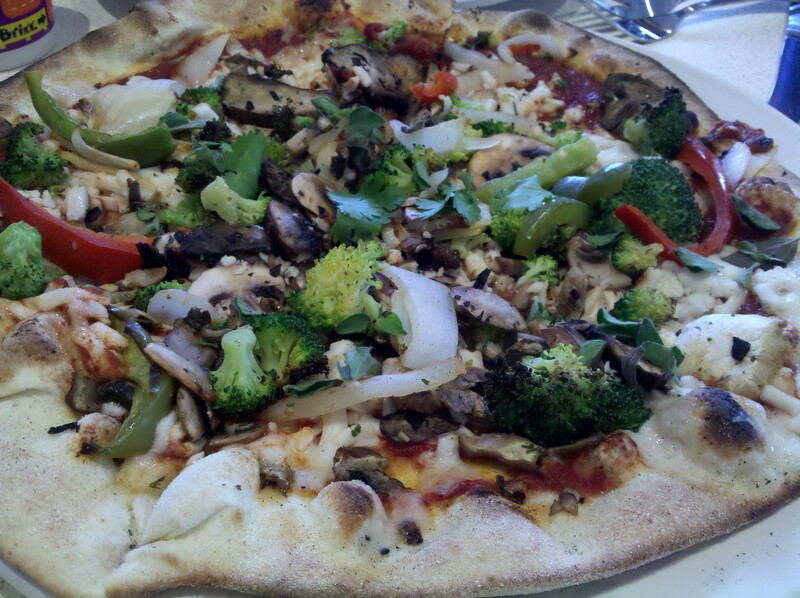 Mellow Mushroom has long be heralded by vegans and vegetarians as one of the few places to munch on tempeh subs or get a tempeh or tofu topped pizza. Up to recently those pizzas and subs had to be cheeseless for vegans due to the casein in the soy cheese they used. Now Mellow Mushroom is beginning to use casein-free vegan cheeses although the only locations in Tennessee are in Knoxville and Murfreesboro. If your location does not carry the casein-free alternative they can be persuaded! Just ask! If you do get vegan cheese at a location not listed above please let me know so I can add it to the list. One of the hardest things to give up when I became vegan was cheese. I think that goes for most vegans I have talked with and most vegetarians name cheese as the one thing keeping them from being vegan. Begin a “strict-vegetarian” and eating cheese must be met with reading labels and investigating for cheeses that do not contain animal rennet. Most brands now use vegetable rennet as a coagulant but some smaller companies still employ the calf-intestine enzyme to set their cheeses. You’ll find it in almost every hard cheese such as parmesan. What is rennet and how is it produced? Dried and cleaned stomachs of young calves are sliced into small pieces and then put into saltwater or whey, together with some vinegar or wine to lower the pH of the solution. After some time (overnight or several days), the solution is filtered. The crude rennet that remains in the filtered solution can then be used to coagulate milk. About 1 gram of this solution can normally coagulate 2000 to 4000 grams of milk. Deep-frozen stomachs are milled and put into an enzyme-extracting solution. The crude rennet extract is then activated by adding acid; the enzymes in the stomach are produced in an inactive preform and are activated by the stomach acid. After neutralization of the acid, the rennet extract is filtered in several stages and concentrated until reaching the required potency: about 1:15000 (1 kg of rennet would have the ability to coagulate 15000 litres of milk). 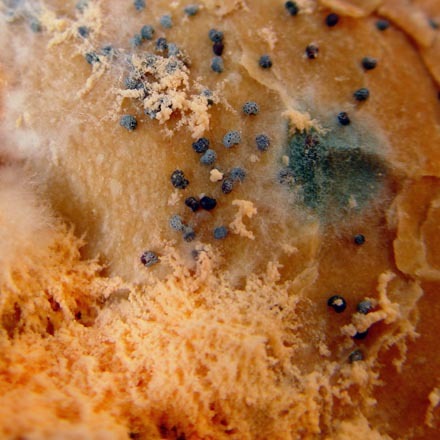 So, you may be enjoying a bit of calf-stomach scrapings with that hunk of cheddar. Considering that and the fact you’re just eating dried, moldy bovine-secretions why keep on eating it? There are some good soy and rice cheeses on the market. True, some are just like eating waxed paper but a few stand out. Follow Your Heart makes excellent Cheddar and Mozzarella, both melt great and the Cheddar can make a mean mac and cheese. Galaxy makes a good rice Parmesan and individual slice, but be sure to read the label as some of their products contain casein, a milk protein aids in melting. Follow Your Heart cheese do not contain casein and melt just fine. Also, don’t think all of those dairy cows live a great life just being milked daily. They are kept pregnant and live short lives, average being 4 years. Are you contributing to the cruel farming of animals by just eating dairy cheese? Yes. While were on the subject of cheese, don’t forget about Cazu Marzu!